Indiana University East welcomes new professional staff to campus this spring. Kathryn T. Lowe is the coordinator of Library Instruction & Service Learning in the Library. As the coordinator, Lowe designs and delivers library instruction and facilitates service-learning experiences that improve student academic success. In addition, she works collaboratively with faculty to plan, teach and assess instruction that cultivates students’ critical thinking skills. 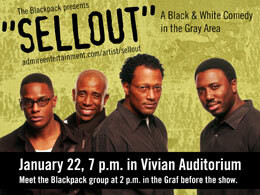 Indiana University East will host the comedy show “S.E.L.L.O.U.T.” presented by The Blackpack at 7 p.m. on Tuesday, January 22, in Vivian Auditorium, located in Whitewater Hall. Dennis Hicks, registrar, attended the 71st Annual Meeting of the Indiana Association of Collegiate Registrars & Admissions Officers (IACRAO), October 25-26, in Columbus, Ind. He presented the session, “FERPA: Educating Your Campus & Staying Compliant.” Hicks was a contributing editor to the AACRAO 2010 FERPA Guide.